My great-great-grandparents Daniel and Fanny got married, at least in part, because Fanny’s twin sister was a good cook. I’ve written about this story before, but to refresh your memory, Fanny was apparently very bad in the kitchen, while her twin sister, whose name I don’t know, was considerably more gifted culinarily-speaking. When prospective suitor Daniel was invited to their family home for dinner, the nameless twin cooked up a delicious meal and Daniel was left to believe his future bride had cooked it herself. It isn’t hard to believe that they might resort to such tricks, because Daniel was probably quite a catch. I don’t know if he had much to offer in the way of money or material goods (probably not), but he was tall, strong (the story goes that he could pick up a chair with his teeth), and very good-looking (at least if the pictures of him as an older man are anything to go by). Fanny was 5 years older than Daniel, definitely not tall, and possibly not as good looking, though the only photographs I have ever seen of her were taken after she bore 11 children over a span of 20 years, which would make a wreck of anyone’s looks. Above, they sit surrounded by their children and grandchildren on the occasion of their 50th wedding anniversary. 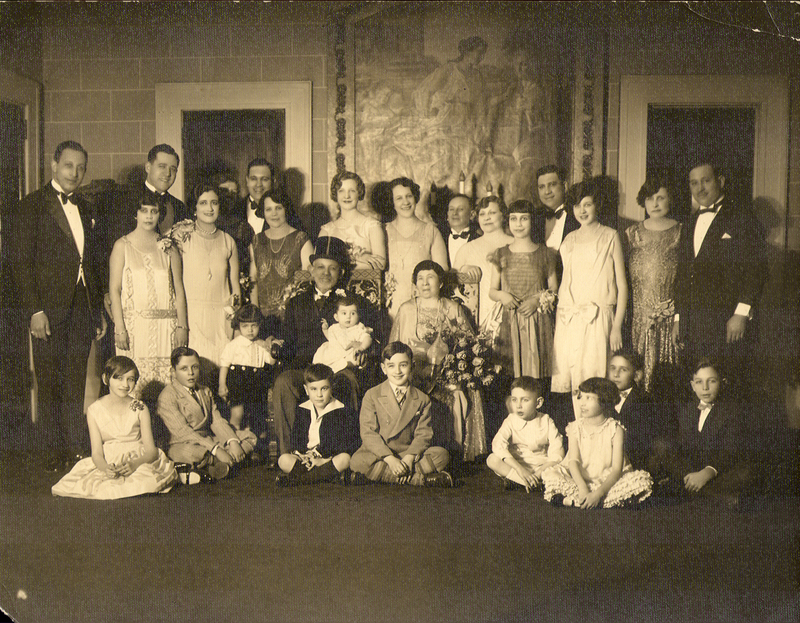 This was probably in the early part of 1927, as my great-grandfather Charlie is pictured without my great-grandmother Rona (they married in November 1927). Daniel and Fanny’s two oldest sons had already died by this time, but it seems that nearly everyone else is pictured (except for, I think, one daughter and her family). When they started in a rural Polish village 50 years before, I doubt that they ever imagined they would find themselves at a black tie wedding anniversary party in Cleveland, Ohio. They came a very long way, and I hope they were proud of what they were able to accomplish. What a lovely picture this is! I love the flapper era dresses with the drop waist bows.